Why the iPhone tourbillon by Caviar is amazing? The camera looks out of place. Exclusivity is a wonderful thing. It makes us feel special. It gives us a sense of superiority. It makes us feel unique. It also makes us feel rich. Why rich you ask? Well, to put it in simpler terms, exclusivity always comes at a price. More often than not. Why am I talking about this? Well, it’s because of the iPhone tourbillon from Caviar. What the hell is an iPhone tourbillon? The Caviar iPhone Tourbillon infomercial. Caviar? I heard that’s tasty. No, you are wrong my mate. It is not fish eggs we are talking about. Caviar is a Russian luxury company that has made similar exclusive things before. Most notably the most expensive fidget spinner and iPhone(s) with American presidents’ portraits on them. This time though, they were not satisfied with just that. Hence, the tourbillon in iPhone tourbillon. “By launching a collection of smartphones with luxurious complications – Grand Complications. By creating iPhone XS “complicated” with a watch with a skeletonized mechanism. We continue the history of the greatest mechanisms integrated into the design. We introduce the smartphone the body of which is complemented not only with a spectacular design, a watch mechanism. No, now, it is not enough for us, and we introduce you a smartphone with a watch and a tourbillon. The iPhone tourbillon,” said Caviar. An admirable statement. Products like this are always amusing. Lew from Unbox Therapy being amazed by the iPhone Tourbillon. This product in particular though is quite exquisite. The iPhone tourbillon has a complicated mechanical watch on its back. The tourbillon is the name of the device that is used to counter the effect of gravity. This makes the time displayed more precise. The tourbillon was made by Swiss watchmaker Abraham-Louis Breguet in 1801. Does it look like I spent a lot? The beautiful and immaculate iPhone tourbillon. The watch on the iPhone tourbillon has a black titanium panel as the base. There are planetary orbits engraved on the titanium panel. The mechanism has been fashioned out of steel. A 7-micron gold coating is also there on the steel to keep it nice and shiny. This beautiful watch on the iPhone tourbillon has 30 hours of power reserve. After that reserve is depleted, one can wind it manually by utilizing the crown on the side. Anything I should know before getting the iPhone tourbillon? Looks good even from this side. But, there’s a glaring flaw behind all this beauty. That is because the included warranty on this thing is pathetic. A mere 30 days for all the fancy components that you are being charged for. And trust me, you are being charged a lot for that. 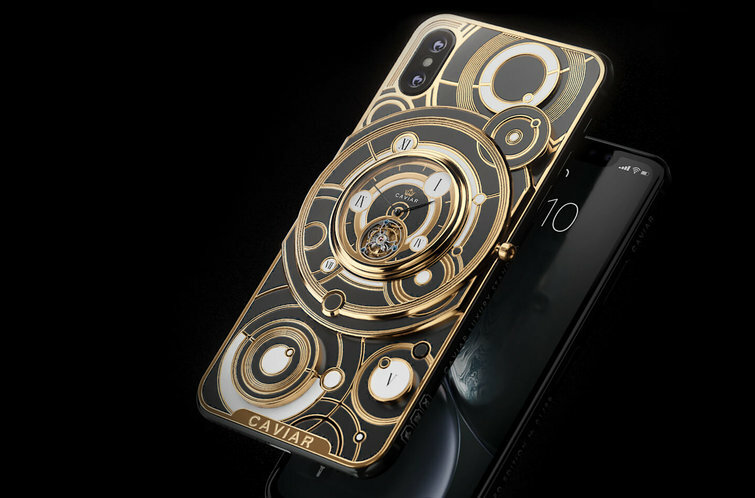 I guess Caviar knows that the owners of the iPhone tourbillon would not care even if the thing was to fall apart after a month. Guess that’s just how rich you have to be to own something like this. To be a proud owner, yo would need to drop at least $8,350. Though, the iPhone tourbillon XS Max with 512 gigs of storage will run you up to $9,790. Also, hurry if you do plan on getting this. Only 99 iPhone tourbillons will be made. Everything you gather is just one that you can lose.